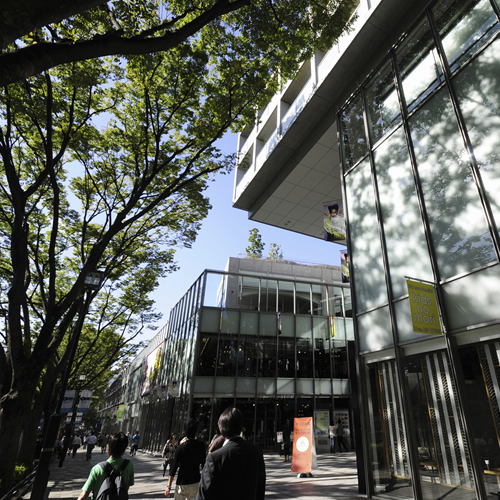 A multi-use commercial complex representative of Omotesando. Distinguished by the sophisticated design of the building by the architect, Tadao Ando. Dojunkai Aoyama Apartment (Aoyama Apartment）, which was constructed by the Dōjunkai Foundation in 1927, was initially a luxury apartment where many officials and university professors lived. Although Aoyama Apartment has long been popular as the symbol of Omotesando, it was torn down in 2003 due to aging and then, Omotesando Hills was completed on the site in February 2006. Omotesando is the name of the street that was laid out as an approach to the Meiji Jingu Shrine in 1920. There is no clear borderline between Omotesando and Harajuku, but Omotesando generally refers to the street that runs from Aoyama-dori Street to the Jingu-bashi intersection (Meiji Jingu Shrine）at Meiji Jingu Shrine (in front of Harajuku Station). Omotesando is known as a shopping street where many flagship stores of high-end brands are located. The famous landmarks are the former Dojunkai Aoyama Apartment and Omotesando Hills, but once you step into the back streets away from the busyness, you will find yourself in a quiet residential area. 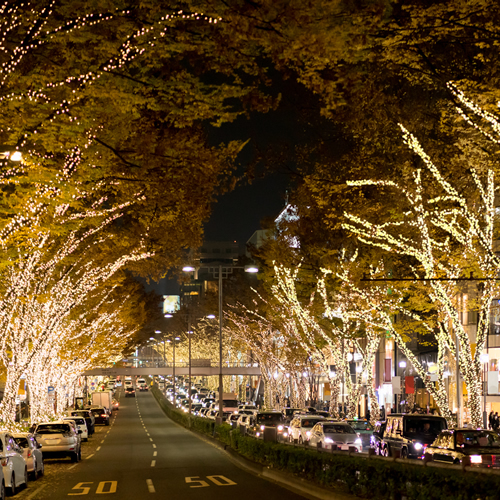 The illuminations of Omotesando that adorn the beautiful Zelkova tree-lined street is one of the events that represents the winter of Tokyo. Christmas illuminations are put up every year inside Omotesando Hills as well, and in this season, the whole area of Omotesando is filled with the Christmas spirit. If you are visiting Tokyo in the winter, please enjoy the difference of Omotesando between day and night. * The following contents were edited by LIVE JAPAN by researching information disclosed on websites. Please use them for your reference. Omotesando Hills has been open to the public since February 2006. It was constructed as a project to remodel the Dojunkai Aoyama Apartment complex, which was developed as a part of the reconstruction project after the Great Kanto earthquake. It was designed by the architect, Tadao Ando and its facade extends a quarter of the length of the Omotesando area, which spans from the Omotesando subway station to Meiji Shrine. The complex, with six stories aboveground and six underground, features a commercial section boasting approximately 100 shops, a residential section and a parking garage with capacity for 196 vehicles. In September 2009, an area for children, Kids-no-mori was established on the B2 floor of the main building. The area has private breastfeeding rooms and nappy change areas and provides such services as baby stroller rental services. The family friendly environment attracts many young people and families with small children, especially during weekends and holidays. It is a 2-minute walk from the A2 Exit of Omotesando Station on the Tokyo Metro Ginza, Chiyoda and Hanzomon Lines. Visiting Tokyo for Christmas? Check Out These Top 9 Romantic Illuminations for 2018-2019!